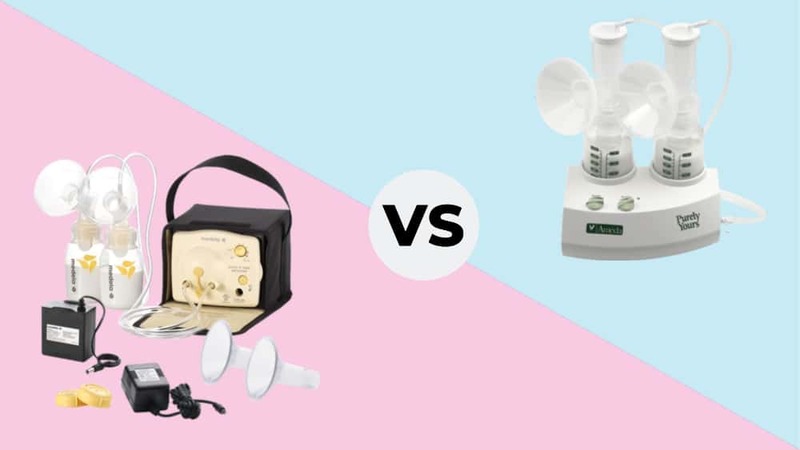 Ameda Purely Yours vs Medela Pump In Style: Which Is Better? Companies are lining up to torture your breasts and help you feed your baby. There’s so many choices when it comes to which breast pump you should purchase, and some of them are super cheap compared to others. Trust me, you don’t want to entrust your breasts to a cheap pump. That’s asking for trouble. 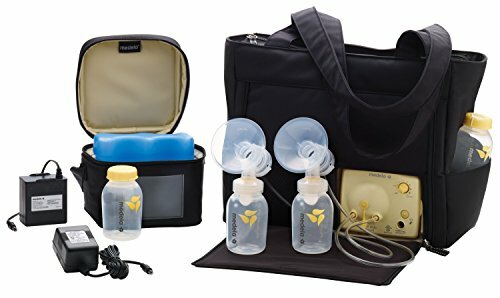 You should look at trusted, reputable breast pump brands. If you’re considering some of the top brands, you’ll want to read this Ameda vs Medela breast pump review. Lightweight design – motor is only one pound. 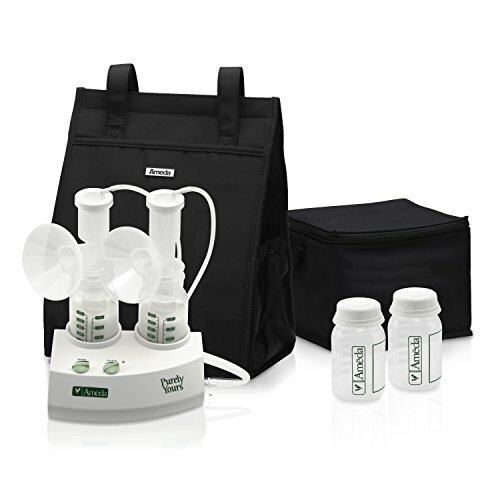 Dual hygiene-kit collection system for your breast milk. Doesn’t use DEHP, a chemical compound some moms want to avoid. FDA approved to keep outside air and milk separated. The price is usually quite different between these two units. Having and raising children is expensive, and there’s a seemingly never-ending list of things to buy. Moms who are watching their budgets will want to consider the Ameda pump instead of the much more expensive Medela pump. Moms who don’t want to feel like they are pumping iron when they cart around their breast pump will prefer the Ameda pump kit, which is almost 3 pounds lighter than the Medela pump. As moms, we cart around so much equipment as it is. Sometimes you don’t want to add to it with a bulky, heavy breast pump. When I took my first vacation as a new mother, my child needed more suitcases than I did. People probably thought I was a total diva walking into that hotel, having to drag a cart behind me with all my suitcases. Believe me, the lighter a new mom can pack, the better off she is. Comes in three bag styles – tote, backpack or Metro bag. Two-phase expression technology, which helps express milk in less time at certain settings. Built-in pump for the tote and backpack. Removable pump for the Metro bag. Moms who are looking for a heavier duty option should consider the Medela Pump In Style. The Pump In Style was meant to be used multiple times a day. The Ameda pump is better for women who aren’t pumping as frequently as that because its suction does tend to lessen with heavy usage. Women who are worried that they don’t have enough milk stockpiled may want to choose the Medela pump. It seems to do a more thorough job of expressing milk. An extra ounce may not seem like a big deal, but if you are going through the trouble of pumping breastmilk, every ounce counts. It’s not a fun process to sit while your breasts are being uncomfortably handled – the only thing that makes it better is seeing the milk flowing into the storage containers. It’s a real morale booster to see them filling up quicker. The choice you’re making to breastfeed your child is commendable, and it may help your baby’s long-term health. But pumping isn’t always easy. Finding a pump that works well for you is crucial to your success. These are both decent pumps, but choosing one over the other requires you to look at your individual situation. If money is no object and you’ll be pumping like a woman on a mission several times a day, you should consider the more expensive and heavier duty Medela pump. If you are watching your funds, and you want a lightweight pump that does a good job for the money you paid, you may want to go for the Ameda pump. No matter which pump you choose, congratulations on your new baby and treasure the precious moments you are about to have. Welcome to the wonderful, wild adventure of motherhood. Thank you for the review, this really helps a lot in choosing between these 2 which options which are the only ones covered by my insurance. This review is really helpful.Thank you! Medela Pump in Style is an open system pump, not a closed system. Thanks for the heads-up, Suz! 🙂 We’ve updated our information. I am the mom of 3 preterm kiddos (yay pre-eclampsia! ), and I exclusively pumped for all three for 13 months, 11 months, and 9 months respectively. My weapon of choice was the Ameda Purely Yours since it was a closed system, traveled well, and I could use batteries, the wall outlet, or a car adapter to power it up. It’s quiet, compact, and makes pumping a breeze if you’re on the go, travelling, or at work. Medela has market dominance in hospitals, but just because a pump is used in a hospital does not make it ideal for every situation. I brought my Ameda pump with me to the hospital for kids #2 and #3 since the Medela pumps just did not work well for me and I got better results more consistently with the Ameda. I also want to challenge your assertion that the Ameda is not designed for heavy duty use. Over three kids I had two Ameda pumps, the first of which was purchased used from another mama that pumped for her NICU kiddo for 8 months. Because Ameda is a truly closed system that does not allow milk to back flow into the tubes if overfilled (unlike the Medela), I felt safe using newer-used pumps. With the first pump, I was able to use my pump an average of 5-6 times a day for another 18 months (1st kiddo and part of 2nd kiddo) before my cat knocked it off the kitchen counter onto a tile floor and the motor did not function as well. My second pump was also second hand, and I finished out kiddo #2, pumped for kiddo #3, then passed it along to another mama who used it for another 10 months on her first kiddo, and she plans on using it as an “at work” pump for her kiddo #2 while buying a new Ameda for at home. These little pumps can take a beating and just keep chugging along. I owe a lot of my success pumping to Ameda – it was a great pump, easy to clean and care for, comfortable (as comfy as breast pumps can be) to use, and produced excellent results.